The Lily Camera is the first autonomous, throw-and-shoot camera in the world, available at www.lily.camera. MENLO PARK, Calif.--(BUSINESS WIRE)--Lily, a company pioneering easy-to-use, self-flying cameras, today debuted the Lily Camera, the world’s first throw-and-shoot that flies itself. Initiated with a simple throw in the air, the Lily Camera automatically follows its owner, capturing stunning footage and high definition images while hovering in place or flying at speeds up to 25 mph. The camera, completely engineered for tough aerial and water environments, is built for outdoor action sports enthusiasts and for anyone who just wants a simple, fun way to record and share their everyday activities. Leveraging advanced computer vision algorithms and GPS, the Lily Camera intelligently tracks its owner, following every move. With autonomous flight, Lily expands creative shooting opportunities well beyond handheld and action cameras with a single point-of-view. For more information and to pre-order Lily, please visit www.lily.camera. 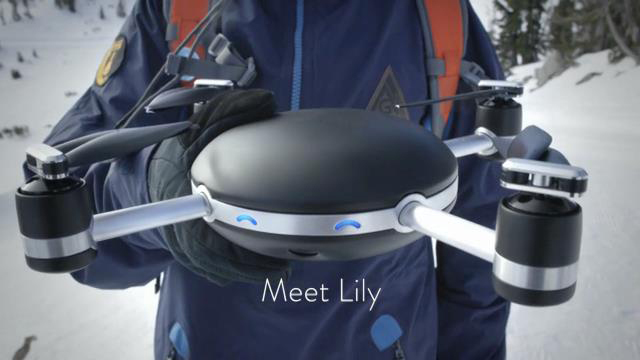 Lily is a technology company that makes flying cameras. Its flagship product, the Lily Camera, is the first autonomous, throw-and-shoot imaging device in the world. Co-founders Henry Bradlow and Antoine Balaresque met while studying computer science and working at the UC Berkeley Robotics Laboratory. The company, founded in 2013 and based in Menlo Park, CA, is funded by top institutional and private investors that include SV Angel, High Line Venture Partners, and Upside Partnership. For more information, please visit www.lily.camera. Lily, a company pioneering easy-to-use, self-flying cameras, today debuted the Lily Camera, the world’s first throw-and-shoot that flies itself.